Saturday 21 September 2013 until Saturday 19 October 2013, 12.00 to 4.00pm. 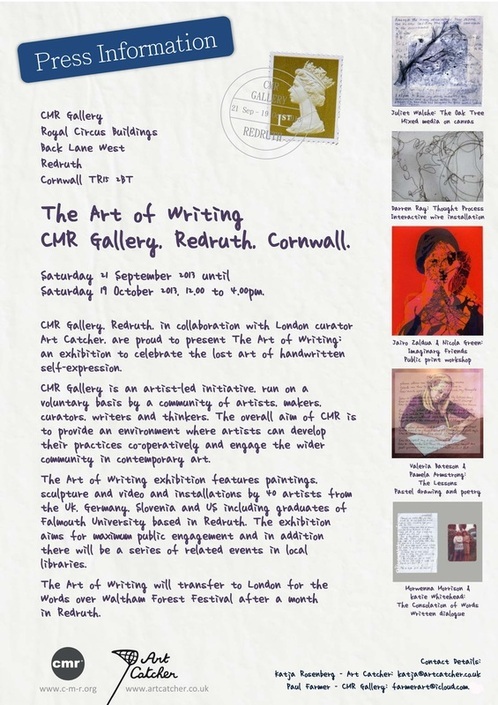 The Art of Writing exhibition features paintings, sculpture and video and installations by 40 artists from the UK, Germany, Slovenia and US including graduates of Falmouth University based in Redruth. The exhibition aims for maximum public engagement and in addition there will be a series of related events in local libraries. The Art of Writing will transfer to London for the Words over Waltham Forest Festival after a month in Redruth.